Abstract: We propose a strategy for dynamic temperature management inside reefer containers in banana supply chains, with the objective of reducing energy consumption and deliver bananas with good quality. In this paper a model is developed to determine optimal temperature profiles for the future days during shipment. To assure the right quality in a dynamic environment, continuous monitoring inside reefers can be used to check the status of bananas. 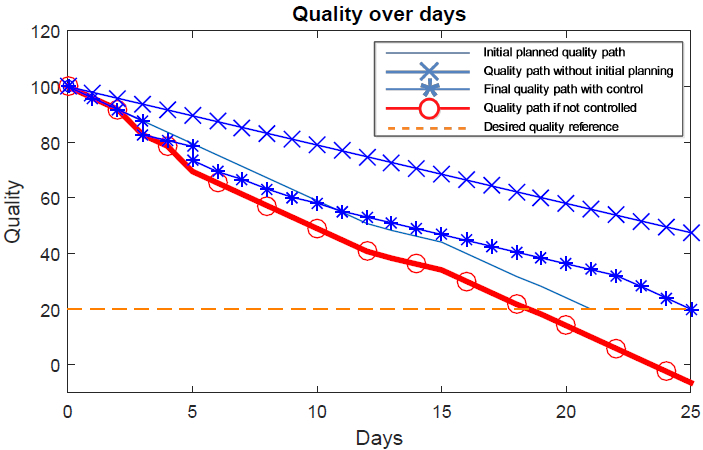 The optimization takes into consideration of disturbances of banana quality and estimated arrival time. Therefore, decisions are updated each day to cope with the possible disturbances. Simulation experiments compare the proposed approach and currently used approach. Results show that with the proposed approach, bananas can be delivered with right quality and reduced energy consumption. Reference: H. Mees, X. Lin, R.R. Negenborn. Towards a flexible banana supply chain: dynamic reefer temperature management for reduced energy consumption and assured product quality. In Proceedings of the 6th International Conference on Dynamics in Logistics (LDIC 2018), Bremen, Germany, pp. 223-230, February 2018.